Ryan Tannehill's contract balloons to $18.7 million in base salary in 2019, when he would count $26.6 million against the salary cap. 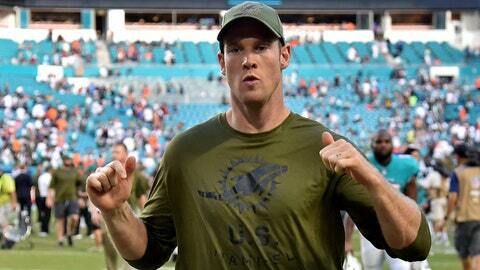 DAVIE, Fla. (AP) — Ryan Tannehill gave a verbal thumbs-up Wednesday regarding the health of his shoulder, as he has done daily since rejoining the Miami Dolphins‘ lineup last week. He literally made that gesture to the bench a couple of times during Sunday’s loss at Indianapolis , Tannehill’s first game in seven weeks. He was responding to inquiries via headset from coach Adam Gase. Physically Tannehill is OK, yes. Returning from an injury to the capsule in his throwing shoulder, he said the pain is manageable and not as bad as last week. He’s wearing a shoulder harness on the field but said his play isn’t affected by the injury. He participated fully in practice Wednesday, which is more than he did last week. But aside from his health, things are very much in doubt. Tannehill’s streak of never taking a snap in the postseason will likely continue, with the Dolphins (5-6) trying to break a downward spiral when they face Buffalo (4-7) on Sunday. Beyond this year, the 30-year-old Tannehill’s future is very much in doubt. His contract balloons to $18.7 million in base salary in 2019, when he would count $26.6 million against the salary cap, which could compel the Dolphins to seek a cheaper, younger alternative at quarterback. Now 40-43 as a starter, Tannehill said he hasn’t been given any assurances beyond this season. He might need to play well in the final five weeks to keep his job. He played well last week and ranks 15th in the NFL with passer rating of 97.2, which would be a career high. But he’s leading an injury-riddled offense, which makes Tannehill’s job — and any evaluation of him — more difficult. The line is in patchwork shape, and explosive, versatile receivers Albert Wilson and Jakeem Grant have been sidelined for the season. Gase conceded play-calling options are more limited without Wilson and Grant. Tannehill’s not one to complain about a lack of support, but he could point out the Dolphins went 2-3 without him, which helped create the hole they’re in. Seven teams in the AFC have a better record, leaving the Dolphins and their quarterback with little margin for error in December. Otherwise, it will be thumbs down on 2018.